An interesting critique under the title ‘The city, the world and what cannot be measured’, written by Adam Frank in a blog post for the US National Public Radio Service in the last days of the old year (Frank 2011), discusses a speech given in 2010 by the Václav Havel, the former Czech president who died on December 11th last year. The full text is also worth reading (Havel 2010). Frank draws out as the main theme of Havel’s talk that we should be pleased when we encounter, and accept, things which cannot be measured; that there can be a value in not knowing things, and even in not being able to formulate the question. This seems a rather negative and inappropriate message to be mentioned in an information science context, which is – I have always thought – about promoting ways to know things, and to find out what is already known. But Havel’s message is a subtle one, as befits a poet and playwright, as well as a politician. He begins by speaking of his home city, Prague, and the ways in which its outskirts, and previously clear boundaries, have been lost in an amorphous sprawl with no structure, and no connection to history or to the way in which people wish to live. What has been created is “some sort of gigantic agglomeration that renders life nondescript, disrupts the network of natural human communities, and under the banner of international uniformity it attacks all individuality, identity or heterogeneity”. This complaint will be familiar enough to anyone who lives in many major city of the developed world. But does it not also have an informational resonance? Have we not heard much the same said about the Internet, imposing a homogenising effect on the variety of printed publications and physical artefacts, and equally imposing a ubiquitous culture based on the English-language language? The Internet, admittedly, is changing, so that these charges may not be as valid as they were some years ago. But I think there is still much validity in this kind of criticism, applied to the information environment as much as to the physical. 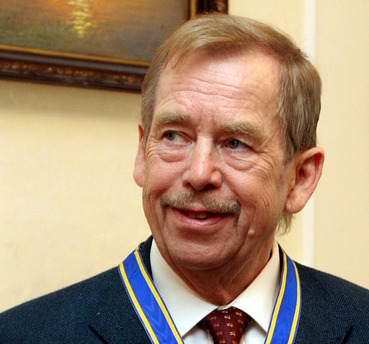 Havel’s message is much broader than this, as he attacks a society “whose basic attributes include the supercilious idea that we know everything and what we don’t know yet we’ll soon find out”. This also has an information resonance. If it isn’t to found on the first page of results from a simple Google search, it doesn’t exist; or if it does it isn’t worth searching for. It seems to me that it is important that the information sciences address this. That they would consider ways in which new information environments can grow more organically from the old, rather than – as it sometimes seems – believing that nothing of the pre-Web world is worth remembering. And that they might keep in mind that, in information terms as much as in city planning, there are, as Havel puts it “some things that we shall never measure, and may never know”.